Do you like to go out, mingle with friends and enjoy entertainment? Are you trying to cut down on your spending, save some money or maintain a more positive financial balance? If you answered yes to those questions, you may think that you can’t have your cake and eat it. There’s no need to withdraw yourself from friends and family because you find yourself with a tight budget or because you are in the middle of paying down your debt and improving your credit scores. You can socialize without spending more money and without having to sit at home while everyone around you is having a good time. A great way to go about saving money, sticking to long-term goals, and enjoying the company of loved ones is to rethink the places you go to socialize. Take a closer look at the kind of activities you participate in and what places you typically frequent. These three factors of social interactions – places, people and practices – don’t necessarily have to cost money provided you’re willing to explore the best alternatives to save your money. Thanks to technology, there are super creative ideas to ‘hang out’ with friends over the internet. 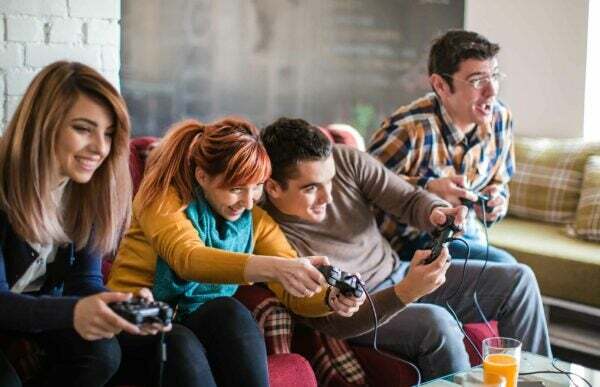 You and your friends can entertain yourselves in various ways, from enjoying music together, playing video games, experimenting with new recipes, and everything in between. Skype, in particular, has fantastic options for people who wish to connect from a distance and socialize. Eating out at a restaurant with friends is going to cost you much more money than it would to make a casual dinner at home and invite your friends to partake. Hosting a dinner party is a good way to socialize while also saving money at the same time. It doesn’t have to cost a fortune to throw a decent dinner party which allows you to save money and still have a good time. There are tons of great tips and saving ideas on the internet that explain how you can host a night bash on a budget. If you are a regular visitor at the local movie theater, then you understand how expensive this kind of outing can be. You spend money on tickets, transportation, and snacks each time you go. How about inviting your friends over to watch a movie at home instead? Switch off the lights and increase the volume on your TV a bit to enjoy that kind of rich sound you normally hear in movies and save some cash. Spending time outdoors is also a good way to get out of the house without breaking the bank. Organizing a picnic or visiting the beach can be a good way to socialize, get some fresh air and save some money all at the same time. Check with your community center or ask around because you will almost always find an upcoming event in your community that is free to attend. There are often festivals and art shows that do not charge admission, or you can take a stroll around the local park or window shop downtown. They are all good ways to get out of the house, enjoy your community and stick to your financial savings goals. Yes, eating meals out at restaurants frequently can become quite costly. However, there are still ways you can enjoy the ambiance and experience of eating out without having to forfeit all your funds. When you go out to a restaurant, begin by making smarter menu choices. For example, choose an appetizer or dessert that can stretch your social time for longer and can replace an actual entrée. By replacing an entrée with a tasty appetizer, you save upwards of 50 percent. That is money you can spend elsewhere or put towards your grocery shopping trip. You can also check online or in the paper for available coupons you can use to bring your total down and save you money. Another way you can attend events and start saving money is by volunteering at major events and even festivals in your area. Most of the time, these events are frantically looking for volunteers to help out. Simply go online, contact the event management team and see what it takes to become a volunteer for their event. Not only are you going to be helping out, but you will also get a fun behind the scenes look at how everything operates while still being able to socialize and have a good time. You can also volunteer at the children’s hospital in your area. If you find that your friends love to hang out and shop, then there are ways you can still participate without having to give the same old excuse of not being able to go because of your limited budget. You need to learn how to be a bit more flexible when it comes to your shopping habits. Set a budget for yourself for the month and stick to it. Secondhand stores are always a great place to find items, and it gives you the chance to find treasures along the way. Flea markets also make for a good outing and can be the perfect setting for you and your friends to socialize while finding some great deals. Try to limit the amount of purchases you make on your credit card as well so you can avoid having to pay interest fees on the money you are spending. Use your debit card instead while sticking to your budget. It’s just one of a few other ways to save. You will also often find that you get invited to birthday parties, home warming, and the like, and these types of social situations typically require that you bring a gift when you attend. When you think of RSVPing for the party, the dollar signs flash in your mind and you find your savings goals moving further away. There are ways you can give a gift and attend the party without spending a lot of money to do so. Instead of spending the money on an expensive, brand name gift, you should instead surprise your friends or family with a gift basket of items you put together yourself. You can find affordable and even discounted items at your local department stores and put them together to make an awesome gift that costs far less than a name brand gift. It can also be items that are both clever and useful so that the gift won’t collect dust. Life is sweeter when shared, but socializing can be costly unless you know and are willing to try out other cost-effective methods to balance your social life and financial goals. Whether you want to socialize at home or downtown, it’s entirely possible to enjoy a great time with family and friends without going outside your budget. If you follow the recommendations above, financial concerns and a limited budget will no longer stop you from enjoying the social life you deserve and crave.